Trust Microboards Blu-ray media for recording and archiving your most important videos and data. Perfect for use in Microboards tower duplicators, Microboards' Blu-ray media comes in 50-disc spindles and records at 4X. Featuring white inkjet printable, silver lacquer printable, white Prism thermal, and white Everest thermal surfaces, the Blu-ray media works with Microboards and Rimage disc printers, recorders, and publishers. Also available are silver lacquer and white inkjet re-writable Blu-ray discs. It's the low-cost Blu-ray media solution! Now available from Microboards Technology is all-new spindled Blu-ray media, the most cost-effective Blu-ray Discs available! Trust Microboards Blu-ray media for recording and archiving your data, videos, and more. Microboards' Blu-ray media comes in 50-disc spindles and records at 4X (BD-R) and 2X (BD-RE). 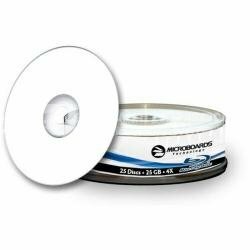 These Microboards Blu-ray media is compatible with all inkjet disc printers and disc publishers. Available in 6 different varieties. Please note: Microboards Blu-ray media is not supported by the Pioneer BD-R101 recorder. Microboards . 25GB . 4X . BDR . InkJet . in . packs . of . 50 . MicroBoards .